The Maid of the Loch paddle steamer, built in the Coronation year, 1953, was to be the last of a long line of paddle steamers to sail on Loch Lomond. 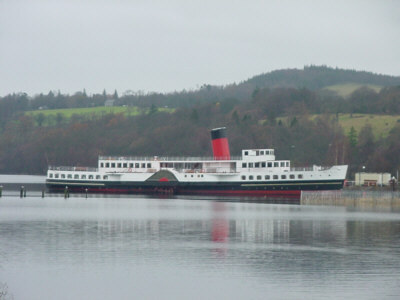 She was withdrawn from service in 1981 and left to decay at Balloch pier. However, in 1993 a restoration project was launched and in 1995 she passed into the ownership of the Loch Lomond Steamship Company, a charity whose main aim is to return her to steam operation on the Loch. You can see from the picture above that things are progressing well.